You’re going to want to leave some space in your luggage. And your closet. Richmond is where you’ll find great deals on the eclectic and the essential. Its busy malls, big box stores, and designer outlet offer one-stop shopping, while its boutique shops and local artisans offer one-of-a-kind wares. 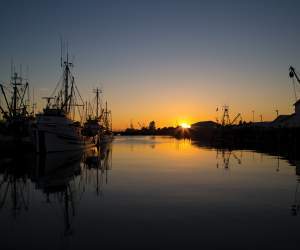 For items you simply can’t find anywhere else, head to Steveston Village and bring home a piece of Pacific Canada. Here, you’ll find boutiques and artisans selling many one-of-a-kind and handmade items. Shops sell everything from jewelry and cool clothing to small-batch foodstuffs and mementos, perfect for gift-giving. You’ll want to dedicate a day to the hugely popular CF Richmond Centre and Lansdowne Centre malls. CF Richmond Centre is where you’ll find familiar global retailers like Apple, Sephora, and H&M. ; Lansdowne Centre is more of a big box outlet home to giants like Best Buy and Home Outfitters mixed in with smaller local shops. There are also shopping centres with an Asian focus, such as Aberdeen Centre, Yaohan Centre, and Parker Place featuring countless boutiques selling everything from trendy Asian fashion and cute sushi sets to beautiful Chinese art. It would be amiss to shop these malls without feasting at the food court, home to eateries dishing out everything from dumplings and curry to bubble waffles and shaved ice desserts. Those looking for high fashion without the high prices will want to make a trip to one of Richmond’s most glamorous shopping destinations, McArthurGlen Designer Outlet Vancouver Airport. Here, you’ll find brands like Coach, Armani, Hugo Boss, Calvin Klein, and much more at up to 70% off retail. It’s just 3 minutes from the Vancouver International Airport (YVR) along the Canada Line, making it perfect for those with a layover at YVR and travellers just arriving in Richmond or making their way home. And, once you get to the airport, don’t miss World Duty Free, where you’ll find over 150 brands like Gucci, Burberry, and Dior, plus beauty products, gadgets, a huge liquor selection, and local art, food, and souvenirs—all available to bring home without paying duties.